Get Your Equity Portfolio Health Check Up for Free! Reaping great returns from your stocks portfolio will no longer be a far-fetched dream as team of our equity analysts will do a complete makeover of your equity portfolio. We empower you to invest in stocks-safely & successfully. Our team objective is to share the right stock at the right price and at the right time based on fundamental analysis. So that you can tap the best investment opportunities and make your investment grow! Hence subscribing to Wealth-Builder could change the way you invest in stocks. And there is no better time to subscribe than now, because we have a very special offer for you. Just subscribe to our Wealth-Builder, and we will provide you a complete analysis of your stocks portfolio, at no extra cost! Yes, you will get your equity portfolio health check up absolutely free and 10% discount on Wealth-Builder subscription. This offer closes on 31st March'16 and is available on first-come-first-serve basis. Once you subscribe to Wealth-Builder, you need to mail your existing stock portfolio to us in an excel file and our senior equity analysts will examine your portfolio. A customised portfolio analysis report will be emailed to you with all the findings and a personalised action plan. Our team will do in-depth analysis of your stock holdings and would require at least a week's time to share the report. You simply need to replicate the changes suggested by our team. With this, you can get much better returns on your investment compared to major indices. If you are a new investor you don't have a stocks portfolio currently, you can still subscribe to this offer now and avail the portfolio analysis facility after 6 months once you have a steady portfolio. We are pleased to share the past performance of our Wealth-Builder portfolio. If you would have invested Rs. 10 lakh in beginning of 2013 in our carefully picked Wealth-Builder stocks and followed our advice making buy / sell transactions later, return on your investment would have fetched profit of Rs. 18,99,000. Wealth-Builder portfolio stocks have given absolute returns of 189.9% compared to Sensex returns of 26% and Nifty returns of 27.4% since 1st Jan 2013. 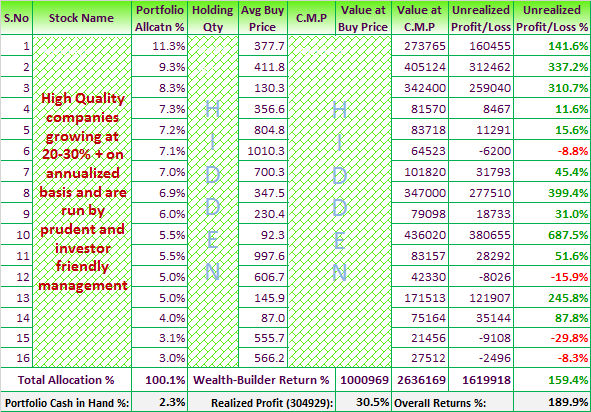 Our 6 Wealth-Builder stocks out of 16 have given returns in the range of 100% to 700% in last 3 years. We do update our members regularly about which stock to buy and which to sell to maximise their returns in longer period of time. Click here to download our Wealth-Builder presentation for complete details. Subscribe to Wealth-Builder annual subscription @ INR 15,000 13,500 and avail 10% discount and also get your equity portfolio health check up for Free under ongoing Holi Dhamaka Offer 2016! Portfolio health check up will guide you to identify the best seeds which you continue to nurture and the weeds which you can erode from your equity portfolio. Click here to know about our ongoing Holi Dhamaka Offer 2016 and applicable discounts and valuable freebies.